Finding a cigar orchid (Cyrtopodium punctatum) in flower is a stunning visual experience. Firstly, a mature plant can be enormous, reaching two feet or more in diameter with pseudobulbs measuring 15 to 20 inches in length. Secondly, the flowers are a vivid splash of yellow and brown that can number from 50 to in excess of 200 on a single plant at the same time. Unfortunately, due to logging, poaching and other causes, these iconic orchids have become difficult to find in the Fakahatchee. It has been estimated that as few as 25 naturally occurring plants remained in the park’s 85,000 acres. Now with a little help from their friends, this dismal count is changing in the orchid’s favor. Dennis works on orchid restoration in 2009. 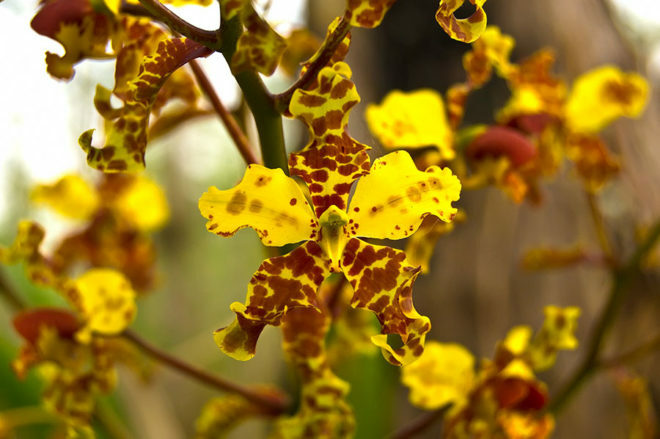 The cigar orchid restoration project in Fakahatchee was conceived in December 2006, when Matt Richards from Atlanta Botanical Garden (ABG) contacted then park manager and FOF board member, Dennis Giardina, about a collaborative effort to re-populate the park with these exquisite plants. Dennis and Park Biologist, Mike Owen, eagerly agreed. The project was about to begin. Assessments of the remaining native plants were conducted by Mike and Dennis in a search for seed donors. A suitable donor, DG 19, was finally located and in 2009, a seed pod was collected and sent to Matt at ABG. Over the years other donor plants in Fakahatchee as well as a closely related plant in the Big Cypress were located. Unfortunately, one of our fellow human beings has since poached the Big Cypress donor. 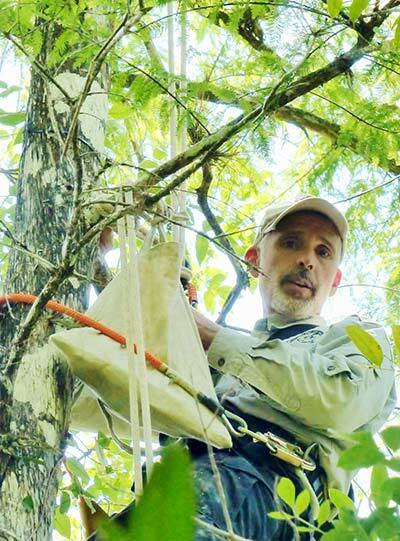 Seed pods were sent to ABG, seedlings became juvenile plants, were measured and documented and finally returned to Fakahatchee as pioneers in a grand experiment. Between 2011 and 2015, approximately 200 juvenile cigar orchids were out-planted in various remote locations in the park by dedicated researchers and volunteers. The plants have been attached to cypress, pop ash and pond apple trees at various heights ranging from 4 feet to 20 feet. Watching Dennis Giardina climb a 30 foot tall cypress tree using ropes and a harness to attach a 6 inch tall plant to a sunlit home is to view parental love at its best. Approximately 1000 juvenile cigar orchids have now been re-introduced to the Fakahatchee through this collaborative effort. The plants are monitored annually, although not all sites may be assessed each year due to time limitations and the remoteness of the out-planting locations. This year’s assessment began on April 16 under the supervision of Matt Richards and Mike Owen. Also lending support, expertise and sweat were Nick Ewy from Naples Botanical Garden and folks from Jacksonville Zoo and Gardens. Also, researchers from Florida International University collect and maintain data on each plant, Jay Staton along with FOF members Dennis Giardina and Karen Relish also slogged through the swamp, stepped over cottonmouths and carried ladders for untold distances to document the success of the project. The FOF Highlifter was used to transport folks to remote locations allowing for more time for monitoring the plants. While 2017 was a tough year for all plants in the Fakahatchee due to the effects of Hurricane Irma, it appears that we have presently an approximate 40% survival rate. Another 400 cigar orchids in the Fakahatchee would be a true success story. So, what was the reward for spending 12 hours a day in the swamp, carrying ladders and collecting data nonstop while side stepping alligator poop? Well, some of us got to see three of our wild, native cigars in full flower. The largest of these was DG 19 with 172 flowers. Some of us got to see number 35, an out-planted cigar approximately 7 years old, with 50 flowers. Some of us got to see a ghost orchid two days away from flowering, an extremely early bloomer. All of us got to see the Fakahatchee, a remote, wild and truly beautiful place.